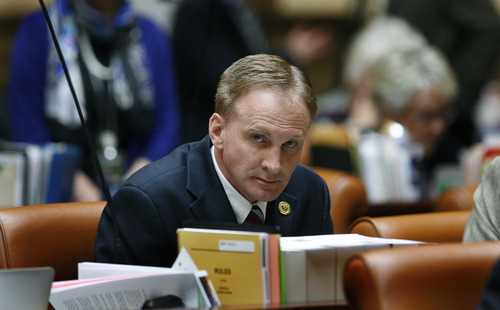 Rep. Craig Hall replaces former lawmaker Neal Hendrickson in Utah's House. Scott Sommerdorf | The Salt Lake Tribune Rep. Craig Hall, R-West Valley City, who replaced longtime Democratic Rep. Neal Hendrickson, listens to debate in the House of Representatives. 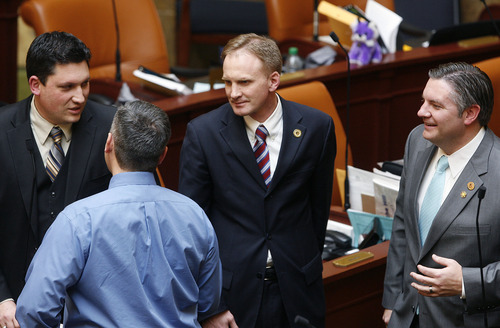 Scott Sommerdorf | The Salt Lake Tribune Rep. Craig Hall, R-West Valley City, who replaced longtime Democratic Rep. Neal Hendrickson, speaks with other representatives after the Thursday session adjourned, Thursday, February 21, 2013. At the far left is Rep. Ryan Wilcox, R-Ogden, left foreground is Rep. Daniel McCay, R-Riverton, and Rep. John Knotwell, R-Herriman at the far right. Rep. Craig Hall, R-West Valley City, is a freshman legislator who doesn&apos;t like to sit quietly on the sidelines. Hall said it&apos;s his children and his love for the neighborhood that finally pushed him to announce he was running in December 2011. "My priorities are making sure that we have a top-notch education system," said Hall, who attended Utah State University and later went to law school at Baylor. "I&apos;m personally invested in making sure that we have a great education system. All of my school-age children are in west-side public schools." Hall, currently raising his family in the same home he grew up in, sends his children to Robert Frost Elementary, where he also once attended. "I love my neighborhood," Hall said. "I love West Valley. West Valley has struggled with growing pains, but it&apos;s a wonderful place to live, to work and to raise a family." Former West Valley lawmaker Neal Hendrickson, who served for 22 years in the state House and enjoyed the distinction of being the only school-bus driver to serve in the Capitol, taught Hall&apos;s children swimming lessons in his own backyard. Hendrickson lost his bid for re-election when he lost the Democratic Party nomination to Liz Muniz  a nomination he had held securely since 1990. "There&apos;s ways to do things and ways not to do things, and if you know the rules, it&apos;s easy to accomplish what you want to accomplish," Hendrickson said. "I enjoyed it. Twenty-two years was a long time. I enjoyed representing the people for that long; I was ready to do it for two more years." Hall feels it was time for a new, younger voice to represent the communities. As the Republican nominee, he won the November election 53 percent to 47 percent for Muniz. Before sponsoring any legislation, Hall sent out surveys to constituents asking questions about their concerns and also visited every school in House District 33 to sit down and talk with their principals. West Lake Junior High, a school Hall has special interest in, has students speaking 31 primary languages. "I appreciate that he came in and took the time to visit the school," said Ike Spencer, West Lake principal. "This is my third year, and this is the first time anyone [from the Legislature] has ever come to my school." Spencer said he gave Hall a tour and told him about concerns not only of crowded classrooms but also of teachers&apos; salaries being among the lowest in the country. His teachers have to be conscientious when working with such a diverse student population. "The key part is to make sure the kids know that we care about them," Spencer said. "We want them to learn and have a future. I want them to have the same opportunities that I&apos;ve had. We must know our subject, but it&apos;s also important that we know our audience. When we&apos;re teaching math, English and other subjects, we can use things that happen in each child&apos;s normal life in order for them to understand it better." Hall is sponsoring a handful of bills, one of which, SB141, speaks to the state&apos;s education funding. According to Hall&apos;s website, "It will allow individuals the chance to voluntarily donate to the state&apos;s education fund through their Utah state tax return. This bill has passed both the House and the Senate and absent a veto from the governor, will become law in time for your tax return due April 2014." Hall is an active blogger and can be followed on Facebook and Twitter during the Legislature. Acknowledging the challenges that come with serving, Hall said he has been inundated with materials to read. "The flood of information is overwhelming," he said. He is also trying to focus his energy on developing strong relationships with fellow lawmakers from both parties and  of course  his constituents. "I have really made it a priority of mine to build relationships with my fellow colleagues and show constituents that I am working for them," he said, "that I&apos;m accessible and that I&apos;m doing my best of keeping them informed."